From excellent temperature regulation and control to masterful humidity, the Farm Innovators Model 4250 Digital Circulated Air Incubator is capable of taking on a sizeable load of eggs to incubate and it does it all efficiently. There is little wonder how this farmer’s favorite is coming highly recommended for both beginners in poultry hatching and rearing as well as seasoned incubator enthusiasts, not to mention its use for educational purposes and hobbyists. 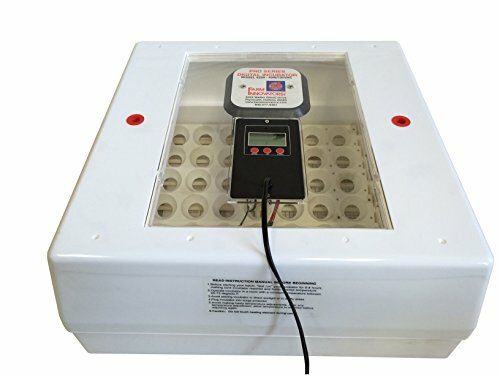 The Farm Innovators Model 4250 Automatic Egg Turner comes equipped with a built-in hydrometer that measures both internal temperature and relative humidity, adding to the efficiency and convenience of this product. To improve hatching and success of the same, a fan kit infuses the inside of the incubator chamber with fresh air that helps stabilize the temperature. It is recommended that when choosing egg types to incubate that you opt for the same species for one entire incubation session. The Farm Innovators Model 4250 can take 41 eggs at one time. Such extensive accommodation is not often available in incubators of this range and product type. Every four hours, this outstandingly practical incubator turns the eggs completely to promote even heating. This obviously eliminates the need to handle the eggs manually; it therefore increases success of hatching. A tech component based on solid-state circuitry imparts long lasting temperature settings that can be relied on with complete confidence. You also have a red indicator light to signal when the heater is functioning. No more doubting or wasting time looking small facts up. These and other simple features add to the convenience and speedy incubation work of the Farm Innovators Model 4250. There is an extra thermometer to help with certain stages of the incubation process. Built much like an open-close toaster device, this incubator is sizeable and not too compact but every facet of its design serves an important incubation purpose. For viewing, you have two large 9 ½ inch and 3 ½ inch see-through windows. This makes observing the eggs during the incubation process quite easy. Not only is the plastic outer shell (made from recycled and insulating polystyrene foam) durable and easy to clean, it serves a dual purpose and protects the eggs inside from jostling, jerking or sometimes accidental shakes. Demanding only a steady 120 volts, this otherwise large incubator displays an energy efficient side. Customers have found that there is absolutely no use for the candler and gauges on the Farm Innovators Model 4250. It is common knowledge that most incubator enthusiasts do not rely on these components anyway. It is recommended that you use the internal thermometers to set the actual temperature and not the gauges. The thermometer and/or hydrometer on the incubator are off most of the time. This can be an issue when it comes to checking up on progress. It is sometimes tricky to spot the water wells but this simple issue can be resolved by adding a few drops of food coloring to the water. This is a well known tip where most incubators are concerned. Run the device for 8 hours to make sure that the temperature is correct. You can then put in the eggs. Using cheap eggs during your first incubation or hatching session is a good idea because you might need to work out some of the kinks. Cheap eggs can save you money or else, if a mistake happens, you could end up having to repeat the whole expensive process with another batch of costly eggs. Ebay has a nice selection of inexpensive eggs for sale. Temperature adjustment can be a bit tricky at the start of using the Farm Innovators Model 4250. However, once you have figured out the heat settings, incubation becomes a relatively simple affair. Bear in mind that even after following the directions, there is an 80-90% chance of success with this incubator product. With superb temperature setting, accessibility, and control, the Farm Innovators Model 4250 takes egg incubation to new levels. From a neat cleanable design to smart egg turning options, these and other features add to the efficiency and convenience of this outstanding product. where is it manufactured as Iam interested in buying where will i get it. Is this an fully automatic. Zeffery, thanks for checking in. This incubator is fully automatic, turning the eggs at regular intervals. The company that makes these is located in the United States, but I do not know if the incubator is actually manufactured in the U.S. The incubator is available in some of the Amazon locations, including in India: http://www.amazon.in/s/ref=nb_sb_noss/257-0817793-3465618?url=search-alias%3Daps&field-keywords=Farm+Innovators+Model+4250+Circulated+Air+Incubator. Good luck.